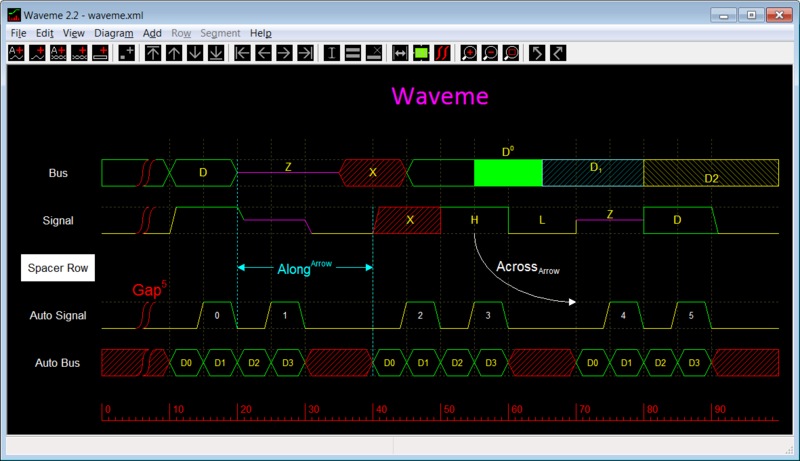 Waveme is a free timing diagram drawing software for digital electronic design documentation. It is GUI-based, highly configurable, and has a wealth of keyboard shortcuts. as well as blank rows (aka Spacer rows). whereas Auto-signal and Auto-bus waveforms are drawn all at once, as a repeated pattern. - Superscript and subscript text is supported in all text entries. - Undo and redo of operations from last file save. - Export diagram to BMP, TIFF, PDF or PNG (recommended) file formats. - Convert a color diagram to a black-and-white diagram. - A diagram is stored in an XML text file. - To achieve a consist look across multiple diagrams, all user options can be stored in a special file, defaults.xml, which when exists, gives every new diagram the same initial look and options.